'All the Knives' fits in with the biannual curator projects organised by the Frans Masereel Centrum since 2004. For the 2012 edition, the Frans Masereel Centre and Z33 launched an international open call for curatorial proposals for an exhibition on graphic arts and printmaking. The purpose of this concept is to make the dynamics of graphic arts more widely known among the general public and to survey into the transdisciplinary nature and new forms of presentation of the medium. The London-based graphic design collective Åbäke was selected and came up with a rather atypical concept. With 'All the Knives', they propose a performative exhibition with very minimal presence, perhaps a chair, a table, a box in an otherwise seemingly empty space. The content of this exhibition is in a state of standby until a member of the audience enters. Performers/invigilators welcome the visitor into a world of stories for which printed graphic items and conversational situations are the catalysts. The show is a collection in constant flux, gathering stories of objects which usually are present in a gallery space or people’s pockets. All the Knives is an exhibition by Åbäke, Yaïr Barelli, Jochen Dehn, Dirk Elst, Aurélien Froment, Vladimir Ivaneanu, Sally O'Reilly, Matt Rogers and Adva Zakai. 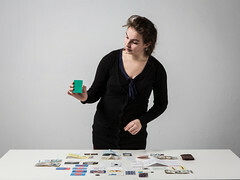 Performers: Oshin Albrecht, Adaline Anobile, Frédérique de Montblanc, Dana Dijkgraaf, Eveline Lambrechts, Lune Léoty, Michiel Reynaert, Rebecca Rosseel, Carlotta Scioldo, Barbara Van Beers, Suzy Vanderbiesen, Sanne Van Giel, Greet Verstraete, Gosie Vervloessem, Sofie Vrancken, Paola Zampierolo. during the opening of the new exhibition Space Odyssey 2.0, the finissage of All the Knives (Any story printed on request) simultaneously takes place, including the presentation of the All the Knives catalog / card game by Åbäke. Catalogus / card game ‘All the Knives’, designed by Åbäke for sale at Z33 for 10 euro.